After you’ve imported your content you can now edit the layout of your portfolio and tell the story of each artifact by giving it a title and description. From there, you can categorize artifacts so your viewers can see each facet of your accomplishments individually. You might also “stack” artifacts on top of one another by creating collections which allows you to keep an uncluttered layout while still being able to include all of your best work. 1. To the right of your portfolio, select the Style & Settings option to format the style of your portfolio. The layout option allows you to choose a layout to present your content. The theme option allows you to change the background from a light to dark theme or choose the resume theme (depending on your audience). This section includes your visibility settings and allows you to manage access. 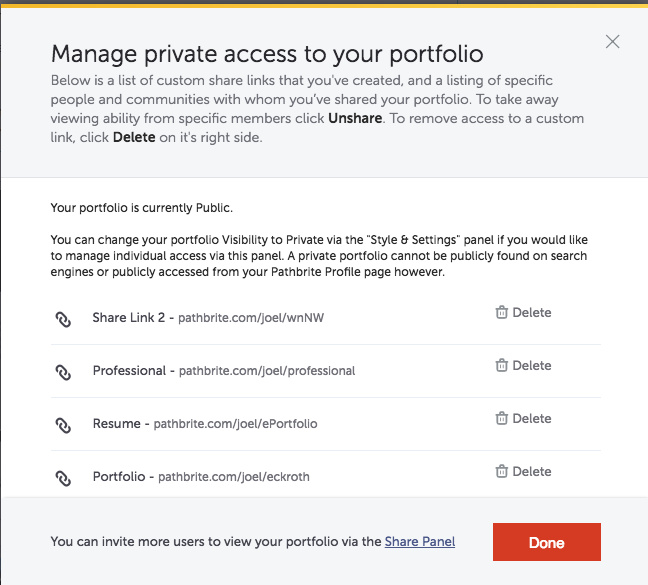 Setting your portfolio to private means viewers must either have a custom link to your portfolio or they must be a Pathbrite user whom you’ve shared your portfolio with. Setting your portfolio to public means viewers must have a link to your portfolio. 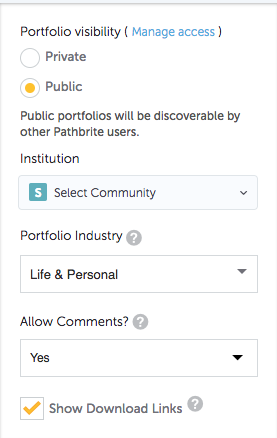 !By default, all Pathbrite portfolios are set to private. Clicking Manage Access will bring up a dialog showing all of your custom portfolio URLS as well as a list of any user that you’ve specifically shared your private portfolio with. These can be deleted which will revoke access to that specific link or email share. You have three options for commenting. Selecting Yes allows anyone who can see your portfolio to leave comments that others can see. Selecting Yes, But only I can see them allows anyone who can see your portfolio to leave comments but only you will be able to see them. Selecting No means no one will be able to leave a comment on your portfolio. !By default, your portfolio is not set up to allow public comments. Be sure to turn on comments here if you want viewers to be able to leave comments and view them on your portfolios. You can choose to allow audience members to download the artifacts in your portfolio. 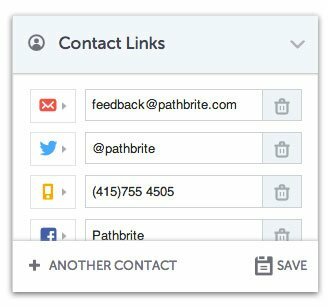 Select the Contact Links button to enter or edit your Contact information. 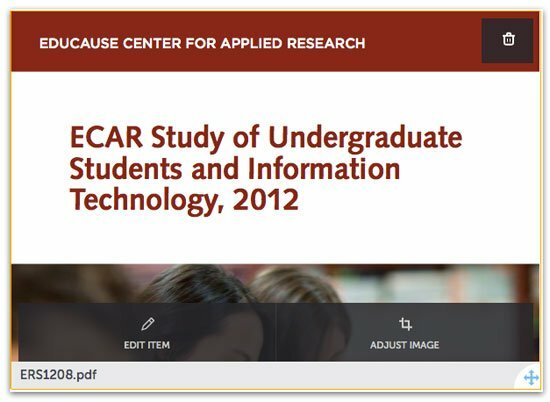 Click the Replace Cover Image icon to find or upload another image to represent your artifact. The icon may also appear as a rotating arrow. ii. Replace the artifact you uploaded by clicking the Replace Work button. When in Edit Mode, click the ? in the upper right-hand corner of the screen. Help notifications will show up and give you more information about each section.